CNCnetControl is a Graphical User Interface (GUI) to monitor and configure CNCnetPDM running on a local or remote PC. 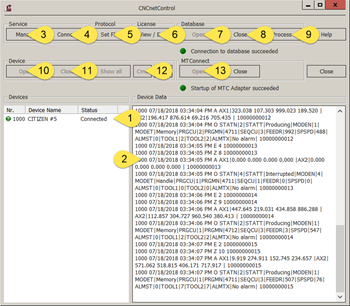 In the lower left pane (1) you can see all devices connected to the selected instance, program or service of CNCnetPDM. Clicking on one of the devices only shows data for the selected device in the right window. Clicking on ‘Show all’ again shows data from all devices. In the right lower pane (2) you see all incoming data from connected devices. Button ‘Manage’ (3) in section ‘Service’ enables you to start and stop a CNCnetPDM background service on a local or remote PC, see 'Manage service'. With button ‘Connect’ (4) you can connect to a CNCnetPDM foreground program or background service on a remote or local PC, see 'Connect to service'. Clicking on button ‘Set Flag’ (5) in section ‘Protocol’ enables you to set the depth of logging for the selected instance of CNCnetPDM, see 'Adjust protocol level'. Button ‘Open’ (7) under section ‘Database’ allows to open a closed database connection. Button ‘Close’ (8) manually closes the current database connection, all data is written to the offline-text-file specified for CNCnetPDM. Button ‘Process’ (9) allows you to write data previously written to an offline-text-file to your database. For details see 'Close / Open database connection'. The light and text below show the current state of the database connection (either green = online, yellow = offline or red = error). Button ‘Open’ (10) in section ‘Device’ enables to open a closed device. With button ‘Close’ (11) you can manually stop data acquisition from a selected device. (device shows up as ‘switched off’ then). Both buttons only get active if you select a device by clicking on it in the left window. See 'Close / Open device connection'.